Whilst briefly staying in the city of Adelaide one of my Arcanum apprentices in my Mastery Cohort who lives nearby was kind enough to join me on a very overcast and a little rainy evening for a walk, chat and photography session in the heart of Adelaide. 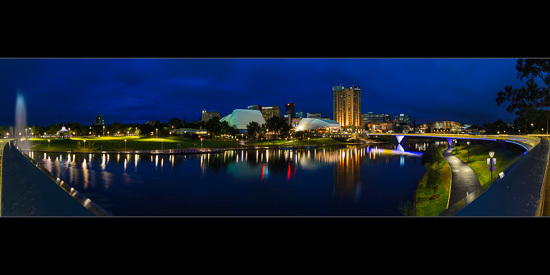 I’d earlier spied a spot on the northern end of the footbridge where I thought a pano of the city CBD with the river in the foreground might work around sunset. I setup and we chatted as I took some uninspired frames whilst the skies just got gradually greyer and the drizzle continued. Finally just before 9PM and about half an hour after “sunset” we started getting the blue hour colours in the sky I was hoping for. It also allowed me to use some longer exposures to smooth the water and get the look I was aiming for. Twelve (12) frames later at 40mm on the trusty 24-70 and I had the source material to make the best stab at this given the conditions. This one is for you Kym – hope you enjoy mate. Thanks for taking the time to play tour guide.